This year’s race starts with Shared Belief. Owned by Jungle Racing (yup, Jim Rome), he was the best 2YO in the country last year, and after returning from injury, has taken his expected place atop the 3YO division. He showed uncanny ability to patiently rate as a 2YO, and has continued to show this discipline in all his races. He faced no real challenges until the Pacific Classic, where he beat a very good Toast of New York and Game on Dude. It was a great effort — after some initial disagreement, all major speed figure makers eventually decided it was blazing fast. His lower speed figure in his last race in the Awesome Again was also misleading. He won, but traveled 7 more lengths than the second place finisher, due, in part, to some controversial race riding by one of his opponents. But he still won and wore down a classy Fed Biz in the stretch. He had every excuse to lose this race, but somehow still managed to find the finish line first. This is simply one of the best things you can find in a racehorse. 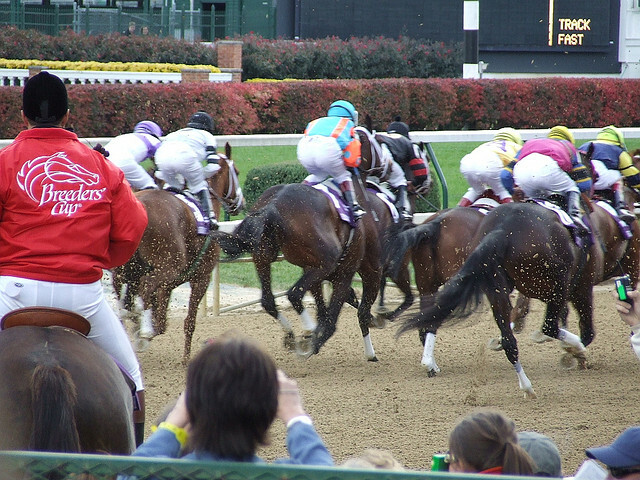 If you watch races closely, almost every horse coming off the pace has some sort of trouble. The best horses are good enough to overcome it. I look for this quality in a solid favorite; I want a horse that can have everything not go his way, and still win. There’s some concern that this effort took too much out of Shared Belief, but Jerry Hollendorfer, his trainer, isn’t above gamesmanship. I’m not too worried about this, but it is a possibility. Shared Belief’s speed is consistent, and you can’t fault his perfect record, including winning at 5 different distances. He’s also won at the classic distance of 10 furlongs and over the Santa Anita dirt track. I think he’ll probably be around 6/5, with the depth of this field, which makes him too short to qualify for an automatic favorite play (discussed in depth here). He’s an obvious include in all tickets, but this is a deep race. I think there is one other in here who could beat Shared Belief on his best (articles forthcoming), and several others who could contend if he is not sharp off of that last effort. Check back during the week for more contender and race previews.